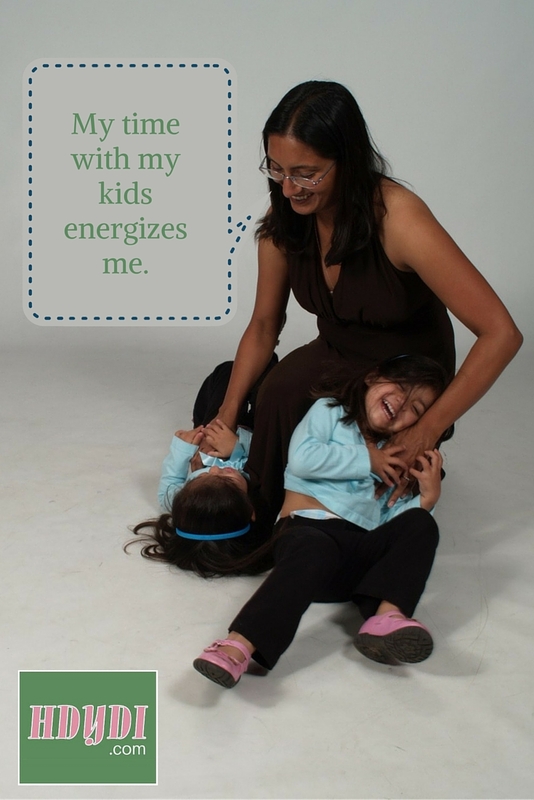 I Like Being with My Kids | How Do You Do It? This summer, while my daughters were visiting their paternal grandparents, I heard over and over again, “Oh, lucky you! Time to yourself!” I couldn’t help wondering how it was that every parent other than me seemed to look forward to their children’s absence. Perhaps it’s the intensity of my extrovert nature, but I don’t revel in the silence of my home when the children are away. I miss them and dislike the emptiness. I only get 18 years as it is, and then they’ll be flying the nest. This whole week that we’ve been discussing “me time” for mothers, we’ve assumed that “me time” comes from putting distance between ourselves and our children. The distance may be physical or mental, but it’s been a constant theme. I’d like to offer an alternate perspective. In my family, we’re governed by the routine of work and school. What unallocated time there is, the children like to spend playing together, reading, or on screen time (2 hours on weekend days, 0-1 hour on weekdays). On weekends, they might to choose to go to the park or pool and they frequently ask to watch movies together. We have an active social life and spend a lot of time with other families. On occasion, though, I’ll claim some time for activities of my choosing. For me, the most energizing “me time” is time that my daughters and I spend together on my terms. I might ask my daughters to play a board game with me, take turns reading out loud to each other, or spend an hour together on the trampoline. I might spend 20 minutes or more discussing with them an interesting article I’d read or fact I’d learned. I might ask them to humour me in visiting a new museum or attending a play or concert. Crucial though it is for parents to have time to nurture all the non-parent parts of themselves, I’m plenty fulfilled by my career on that front. The best of my “me time” is spent just being with my kids, each of us fully present in our togetherness. From August 31 to September 4, 2015, How Do You Do It? is running a series on “me time”for mothers: why we need it, how we make it, what we do with it. Find the full list of posts on the theme week page. This characterizes a lot of “me time” for me over the past year, too. It’s usually the one-on-ones I have with my girls…the pastry shared at the coffee shop before we go grocery shopping, for example. It’s a treat for both of us, for sure! I remember when we first met and you told me your children were away for the summer…I just kept thinking that you must be one of the strongest mamas I know to be capable of such separation. Perhaps your unique situation makes you appreciate these short 18 years more. Whenever I get overwhelmed, I try to remember that this time with my quatro is fleeting. Thank you for reminding me yet again, to be ever appreciative of the “just one more story mama”, “can you cuddle me mama?”, and other moments that are sure to be gone all too soon.